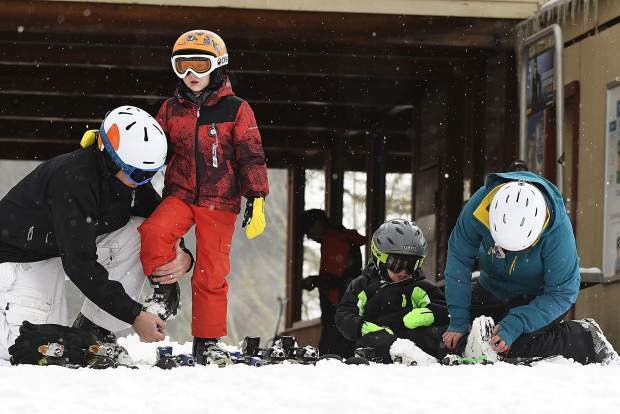 Edwin Pipers, left, and Emily Pipers, far right, help their sons Clark, 6, and Charlie 3, gear up for the first run of the season Friday at Sunlight Mountain Resort. Sunlight celebrated their 52nd season with one of the resort's earliest openings on record. “It was fun! It was powder!” exclaimed the Rev. Wendy Huber, priest at St. Barnabas’, St. John’s and All Saints Episcopal Churches in Glenwood Springs, New Castle and Battlement Mesa, respectively. According to the National Weather Service, a weekend winter storm was expected to bring as much as another 9 inches of snow to the Sunlight area Friday night and into Saturday, with an additional 6 inches to a foot of snow by Sunday morning. Huber, a season-pass holder at Sunlight, spread the fragrance of incense down Midway run for her inaugural turns on the hill. Christian Hiller certainly hopes that will be the case, as not only a regular snowboarder but a Sunlight employee, too. But, with the Thanksgiving holiday falling extra early on the calendar this year, Sunlight General Manager Tom Hays said it’s the earliest opening since at least 2000, when the area had a pre-Thanksgiving opening Nov. 18. Hawks said a Thanksgiving weekend opening for Sunlight, at least on the lower part of the mounting, could become the norm as a result of the new snowmaking equipment the resort has invested in. A recent survey of Sunlight visitors found that the biggest cohorts of people are those who have been skiing Sunlight for four year or more, and even more so those who’ve been skiing the local area for more than 10 years.